Hello all! The star of my zombie collection, The Z Word, is back in a new short story called Check the Halls (for Brains and Zombies), available in An Undead Christmas in paperback and for Kindle. In this story, Zach escapes a ton of zombies and takes refuge in an apartment building, only to see a lit up Santa displayed on a nearby rooftop. He follows it to discover a small community of survivors who, after almost shooting him, invite him to Christmas dinner. Inside the safety of their fenced-in private school, they have some semblance of a normal life, enough to enjoy the holidays together. But is their haven really as safe as they think? Check out Check the Halls (for Brains and Zombies) and many other fine holiday zombie shorts in the new collection by editor Anthony Giangregorio. Hello all! I was asked to write for an upcoming holiday horror book that collects zombie short stories that take place during Christmas. Fun, huh? It’s about my favorite zombie killer, Zachary Ward (recurring character in The Z Word), who is chased into a building in the city by zombies only to discover a school in the distance decorated for Christmas. He heads towards the survivors, gets to know them and celebrates Christmas like only a true zombie apocalypse hero can…by saving the day and killing zombies! 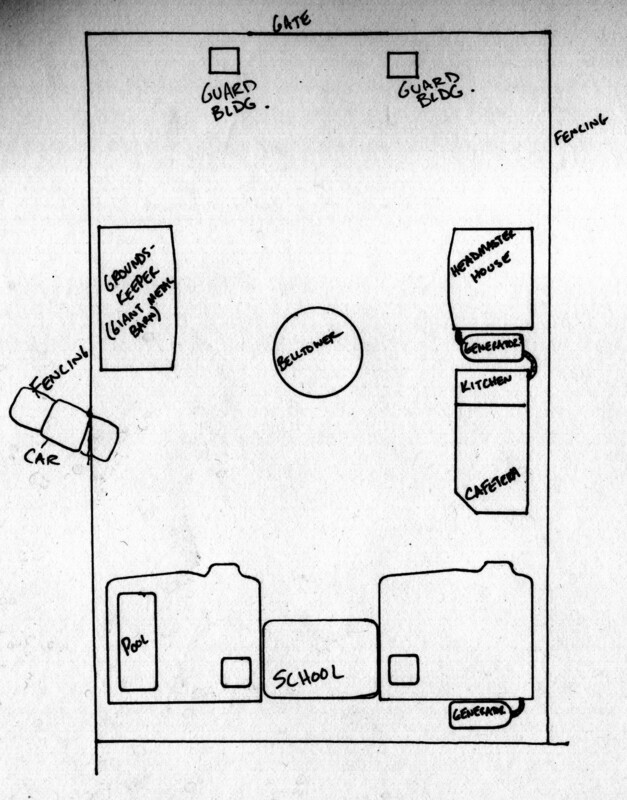 I was having trouble picturing the property, so I drew one up as a rough sketch. It really helped move the story from building to building. I may have to do this more often! Anyway, the book won’t be out until closer to the holidays, so keep an eye out for it! And if you haven’t read The Z Word, check it out!